I’m gonna be honest- this time of the year is ROUGH. I forgot how busy I get around this time of year due to the end of the school year and I’ve been absolutely swamped. Mix that in with my sister-in-law’s graduation AND Mother’s Day…it’s been busy. SO busy, in fact, that although I made my Baby Bump Monday chalkboard this week, I haven’t even taken pictures for it yet. Ugh. Failure! HOWEVER, to make up for it, I’m bringing you some other bump pictures from the weekend with Oakleigh Rose maternity style and a giveaway! Yippee! How far along: 21 weeks! We are over the halfway hump and are getting closer and closer to meeting our Addison! Maternity clothes: In today’s post I’m wearing this gorgeous Strawberry Wine dress from Oakleigh Rose! It’s actually not part of their adorable maternity section, but works perfectly for my growing baby bump (plus, Mathew loved it so much, he could hardly keep his hands to himself)! What I love about this shop is that Oakleigh Rose is a small, family-owned and operated, Christian business with a goal of making women feel beautiful in their own skin. They truly strive to offer impeccable customer service and satisfaction and offer free US shipping and returns. After I placed my order, Meaghan (the co-owner) had my dress shipped out later that day! They also donate a portion of their sales to a different charity each quarter. The 2nd quarter of 2014 is the Humane Society, and if you’re an animal lover like me, this is just ANOTHER reason to snag some clothes from Oakleigh Rose. Stretch marks: Even though I’m using cocoa butter religiously, my “girls” have little stretch marks. Thankfully I don’t see any on my stomach yet, but I can’t really see the lower half of my stomach anymore, so I’m just relying on the mirror. Yikes! Belly button in or out: Innie but it’s not as deep as it used to be. It used to be a black hole and now it’s more like half of that. AH! Sleep: I bought a Snoogle and it was the best investment ever for sleep. Sure, it takes up 1/3 of the bed, but it’s all good! Best moment this week: We found out at our gender/anatomy scan that Addison has a few complications. She has a cyst by her rear, and the doctors had mentioned 3 other things. We cried, we had tons of tests run, and our best moment last week was finding out that 1) She is negative for trisomy 13, 18, and 21, and 2) those 3 “other complications” are no longer a concern of the doctors. My pregnancy has turned into a “high risk” one, but we will be getting to see Miss Addison every 2 weeks for ultrasounds to make sure her cyst stays below 12% in comparison to her body. Right now it’s only 4% which is great, and I fully believe that God had everything to do in making sure our baby girl was safe and healthy. Finding out that 75% of their worries were taken away was a HUGE blessing and was the best moment for us. I would absolutely love prayers, however, for us, Addison, and for all the doctors we are seeing right now. Miss anything: Hot sauce. I stupidly ate hot wings the other day for the NFL draft, and regretted it 2 hours later when it all came back up. Worst EVER. Movement: Addison is a ninja! She’s always moving around and movements are getting stronger and stronger! Cravings: Still holding strong to my milk craving! I guess she needs lots of calcium to grow those bones! Looking forward to: Trying to get started on a baby registry soon! We will be pretty busy in the weekends to come, but people are starting to ask where we’re registered, so I guess we need to get started! Confession: I’m not a football fan. I never grew up in a “college town” or really went to a college that prided themselves on being a big football school, and I never grew up in a household where sports were a big deal- especially pro sports. My dad would rather fish or sail on his sailboat than watch a football game, and I’m perfectly ok with that. However, since dating (and marrying) Mathew, I realized that the Superbowl was something that was really important to him. Knowing that, I’ve always tried to make the SuperBowl a successful event, and year after year have honed in my SuperBowl party skills. Planning the perfect Superbowl party may look difficult, but with enough time and preparations- it can absolutely be a success! I’ve got some great tips and tricks to ensure that planning the perfect SuperBowl party is a breeze for you! 1. Plan ahead. No one likes a last-minute planner. Several times I’ve gone wrong and not planned until the Wednesday before. Oops! Just like with any party, give your guests ample time to make plans to come to your house! Pretty much everyone I know ALWAYS has their phone on them, so I use Evite to create party invitations that are emailed to my guests. Not only is it fast (and they have tons of different invitation options), but you can also add a poll or sign up list to your invitation. Sign up lists are incredibly effective in getting your friends to sign up to bring some goodies if you don’t want to be slaving in the kitchen all day. Here’s an Evite I recently made for our perfect SuperBowl party! 2. The perfect SuperBowl party essential- FOOD. We all know that food is one of the best things about a SuperBowl party. I’m a huge fan of hot wings, but this year I’ll actually be making The Pioneer Woman’s Buffalo Chicken Bites from her book, “A Year of Holidays“. I got it for Christmas and I’ve been DYING to make these. I actually am making them this week for dinner to “test” them out. Ok, so….I may just want them just because haha. Also, my mouth is salivating. I also love making 7 layer dip in small cups so people can double dip in their own cup, and religiously make chocolate covered strawberries decorated like footballs annually. Make sure you’re prepared before you go shopping though, and check out the SuperBowl sales from Coupons.com so you can save some money! 3. Decor, Decor, Decor! Decorations are a huge part of parties and the SuperBowl should be no exception. Honestly, I check out my local dollar store and the Target dollar bin section before I hit up party stores. Party stores are so pricey and for a game that’s only a few hours long, I’m usually more willing to shell out money for food and not decorations. I love the simple turf tablecloth and easy-to-make pennants in this picture below. You could easily find these things at your dollar store, but if you can’t (and want to save money), ask a friend to “co-host” the party with you to help disburse the costs! Make sure you get themed plates, napkins, cups, and more! 4. Have fun! Here’s the thing- party planning can take a lot out of you. My advice is to get as much of the food and decorating done the day before the party so you can actually enjoy yourself and truly have the perfect SuperBowl party. There’s nothing worse than being stuck in the kitchen all day, and even if you’re like me and only watch the SuperBowl for the commercials, it’s still definitely more fun to spend time with your friends. Also, do yourself a favor and buy paper plates- no one likes to help with the dishes after a big party. It’s a buzz kill. 5. Win an awesome SuperBowl giveaway for $250 to Coupons.com! 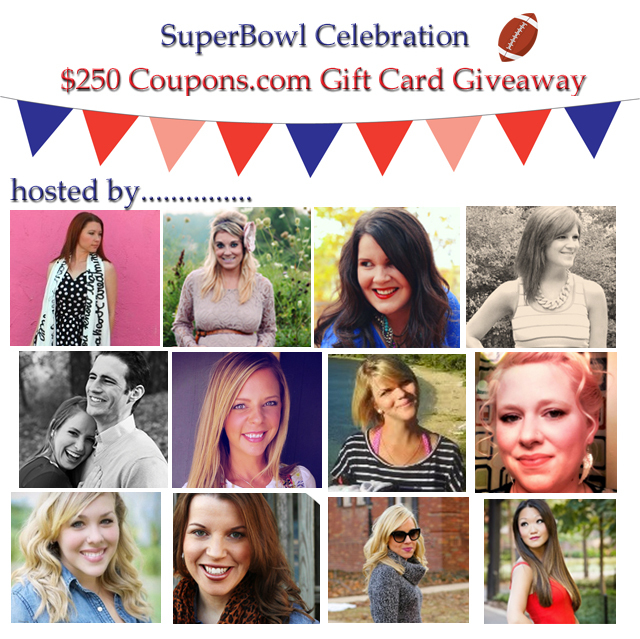 If you TRULY want the perfect SuperBowl party, enter this giveaway from Coupons.com, myself, and several other amazing bloggers. Everyone could use $250, right?! Disclosure: I received products in exchange for this review. My words and opinions are HONEST and are my own. Around this time of year, I feel like I get complacent with my life. Work is coming to the end for the semester (which means I’m giving tests, reassessing my students, and working on large projects to make my classroom better each and every day) and Christmas is nearing, which means I am panicking over gifts for my very large family and friends. I live life by a schedule: get up, check my phone, get showered and dressed, drive Mathew to work (we’re still with one car), get to work, do last minute preparations for the kids, work all day, leave an hour late, pick up Mathew, cook dinner, grade papers, watch tv or blog, and go to bed. The next day? I repeat. I recently got a shirt from 11:11 Apparel’s new collection, and it said “Live with Passion“. The same day in the mail, I got a beautiful sterling silver Branch Necklace from Blue Nile. It was like something sparked in my mind and I thought to myself- Am I branching out and living with passion? I find myself struggling just to keep up with the day-to-day while still getting a good night’s sleep in. I find myself cancelling time with friends, time for myself at the gym, or even a quick prayer time with God because I’m simply “too busy.” Buying Christmas gifts has also been a source of stress this year for me, not because of the money, but because of the time that it takes to shop. Time that I don’t have. I’m not branching out and living with passion- I’m just simply living. I decided that this needed to change. NO MORE COMPLACENCY! So how do I plan to fix this? 1) Remember that the Christmas season isn’t about stressing over gifts. All I need to do is get on my computer, head on to Blue Nile or 11:11 Apparel and get all the Christmas presents I need! (DUH) But really, Christmas gifts are SO not what anyone should be stressing about. Besides, Christmas is about Christ’s birth! 2) Take more opportunities to do the things I love. This means spending time asking my friends to go out to chat at Chuy’s like I used to, doing random kind things for my co-workers, going out to the movies on Friday nights because I’m not as old as I think, inviting family over to our place more often, and living without regret. 3. Save for vacations. Vacations give me so many more life experiences than I normally could have here. I think it’s important that Mathew and I save for another vacation for next year. We want to go back to Mexico where we had our honeymoon next Christmas, but it’s going to take a lot of saving. I’d love to zipline through the jungle, swim in a cenote, and for once look HOT in a bikini. 4. Give more time to God. My prayer life stinks. I pray during the day several times for various things, but I never truly sit down and just PRAY during a silent time in my day. I am going to try to make an effort to change this. I feel like the more I give to God, the more He will help me see how to live my life with passion for HIM- the way I was meant to. Sure, my list is small, but it gives me room to grow! I can’t wait til 2014 to start my “resolutions”- I better branch out and live with passion NOW before it’s too late and time has passed far too much on by. So here’s the thing- I love the reminder that the shirt and necklace have in my life, and I want to share that with you. That’s why Blue Nile and I have teamed up to give YOU a Branch Necklace in Sterling Silver! It will come in a pretty blue box with silver ribbon, and you can choose to keep it, or spread some joy by giving it to someone you know and love this Christmas! Let it be that reminder to you to branch out and live with passion just as it has for me. I promise- it’ll make a difference in the way you live your day! Don’t want to wait for the giveaway to end to get your necklace? Blue Nile is graciously offering 10% off ANY purchase with code bnhh10 at checkout! Also, 11:11 Apparel is generously offering 20% off your order with code HAPPYHOLIDAYS at checkout!